Amerisleep is a popular company that sells a line of memory foam mattresses online. One of their most popular models is the AS3 mattress (formerly known as Liberty). I have tried the AS4 and AS2 before, and overall I enjoyed my experience with them. I was excited to see how the AS3 felt and compared to the other mattresses from Amerisleep that I’ve tried. The company believes that there is not one best mattress for everybody, and so it created a line of mattresses catered to different types of sleepers. The AS3 is one of the best known of those mattresses. Read on for my full Amerisleep AS3 Bed review. You Want The Benefits Of Memory Foam Without Some Of The Drawbacks– The AS3 has great pressure relief and contouring, which is something memory foam is known for. However, the mattress does not sleep hot, and because the foam is fairly responsive, you don’t ever really get the feeling of being stuck (which is a common memory foam complaint). You Value The Extras Put Into The Construction– Amerisleep puts some nice extras into their construction. The celliant cover is one example. I would encourage you to look into the science behind celliant, but the claims are that it can have numerous health benefits. The company also uses bio-based foams and takes extra effort to make sure their mattresses won’t sleep hot. The cost of the materials in the AS3 are definitely more than almost all other mattresses at this price point, meaning you can really get a great value. You Sleep On Your Side Or In Multiple Positions– I agree with the company when they state it has a medium firmness level. For me, the pressure relief was great when I slept on my side. It was also still supportive on my back and stomach, so I think it’s a good fit if you sleep in multiple positions. If you just sleep on your stomach or back, then there are other models that would be a better fit. You Sleep With A Partner– The AS3 does an amazing job at isolating motion. That means if your partner moves around, you typically won’t be disturbed. You Sleep Just On Your Stomach Or Back– While the AS3 is really great for side sleeping and combo sleeping, it may be a little too soft for people who just sleep on their stomach or back. Amerisleep has other models that might be a good fit for you if you fall into this category of sleeper. The Memory Foam Feel Isn’t For You– I’ve found that the memory foam feel is typically a love it or hate it type of thing. While the AS3 is more responsive than most memory foam mattresses, it still retains that slower-moving, gradually sinking feel. If you don’t like that type of feel, then you would probably want to look elsewhere. You Want A Bouncier Mattress– Latex or innerspring mattresses will provide more bounce and response than the AS3 does. This is typically just a matter of personal preference, so figure out whether you like your mattress to have more or less bounce. If you want more bounce, then maybe consider a latex or innerspring mattress. The company states that the AS3 has a medium firmness level. I would tend to agree with that. 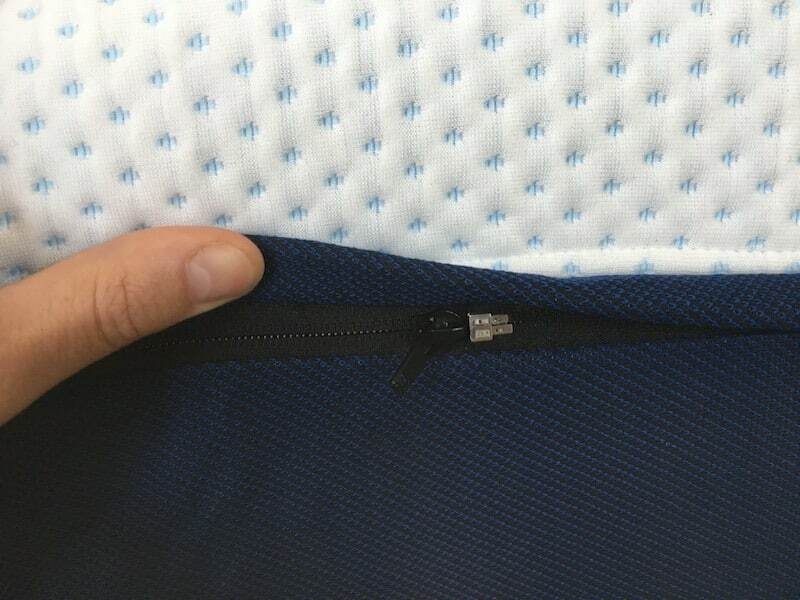 You can see from the video below that I can push my hand into the mattress somewhat easily at first, so there is definitely some initial softness to the feel. You can also see that the mattress has a memory foam feel but is probably more responsive than most other memory foam mattresses. As a result, I felt like I got good pressure relief without the feeling of sinking in too much or feeling stuck. For an Amerisleep feels comparison also check out my AS3 vs AS4 and AS3 vs AS2 reviews. The construction begins with the cover. What makes the cover unique is that it is made in part with celliant. I would encourage you to look into celliant technology, as there are certain studies that show it can have numerous health benefits. I can’t personally vouch for those claims, so definitely do some research on your own and see what you think. Base layer is 7 inches of 1.8 lb. density polyfoam. The company constructed this mattress in order to cater to side sleepers and combo sleepers with a medium firmness level. 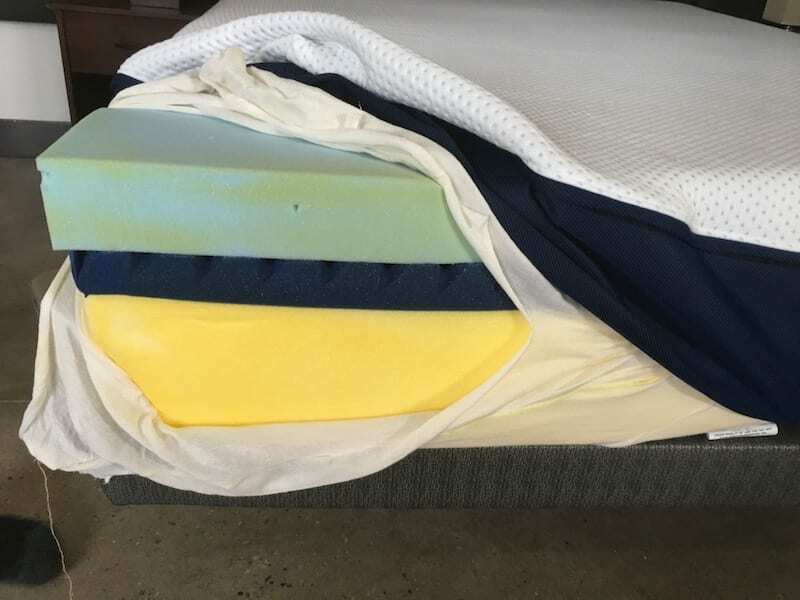 Overall, the mattress should be very durable, as their unique manufacturing process makes their foams much more durable than other foams with similar densities. For a Queen, the AS3 is $1,199. However, you can typically get $100-150 off your purchase as the company is usually running some sort of promotion. The AS3 does a very good job at isolating motion. As you can see from the video below, when someone moves on one side of the bed, the other side of the bed barely gets disturbed at all. That makes this option a really good mattress for couples. Amerisleep mattresses sleep cool, and they do so perhaps more than any other memory foam mattress I’ve slept on. The combination of celliant and bio-based foams is perhaps what does it, but I think most would agree the AS3 does sleep nice and cool. The video below shows that this mattress works great with an adjustable base. I think the AS3 is a great option for side/combo sleepers who want a memory foam feel without the main drawbacks memory foam is known for. I think the mattress is a great value and is definitely worth taking a hard look at. Do you know if they ship to Hawaii? Have you tried Mlily mattresses? I’m looking at the serene eternity but cant find many or any reviews. Haven’t tried them just yet. Hi there, haven’t made a purchase yet. Struggle with the fact that we can’t lay on it prior to purchase and we are in Canada. 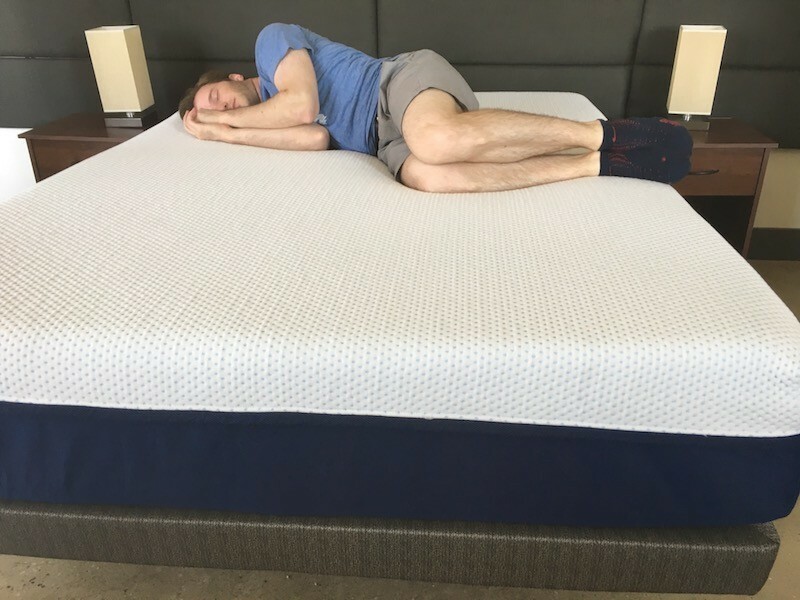 I’m trying to compare to a Stearns and foster hybrid 2 in king size, which also has spring technology and memory foam and I love it, but reviews for s+f overall aren’t super favourable and dealing with warranty is challenging from what I understand. I sleep on my back mostly but switch to side and sometimes stomach, i’m 5’6 and 115 lbs, my husband is a side sleeper and is 5’10; 215 lbs, I need back support for my lower back but our current mattress is too firm. I need to feel supported and hugged.. like i’m on a cloud.. but don’t want to feel like I can’t move or I’m stuck. Also keeping sagging on my husbands side in mind as our last mattress sank on his side by probably 3 inches. I need help choosing as this also doesn’t have any spring technology which i’m not used to. We are also looking to avoid purchase of the base and hoping to use our existing box spring. Any help would be appreciated, thank you. Have you taken a look at Helix? Is it easy to return based 100 day return policy? We purchased a queen size as3, and it seems smaller than our previous mattress. Has anyone else noticed that? After recent changes, you just get the $200 off that you are referring to. So $1,199 would be the lowest price available at this point in time. Hi Joe! I have a question about temperature control and heat retention. In the video review you said you think this may be the best memory foam mattresses as far as sleeping cool. I’m confused, because you gave this a 3.9 (in 2017) on the “Doesn’t Sleep Hot” scale, but the Loom & Leaf got a better score of 4.5 a year earlier in 2016. Do you know which one you would say is a cooler memory foam mattress? 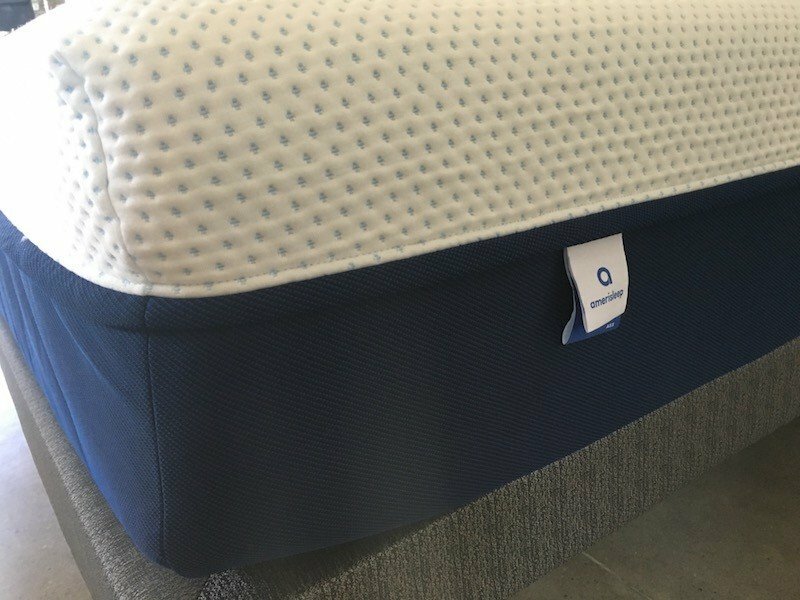 I found a very good deal on an Amerisleep AS3 (from 3rd party) for a few hundred cheaper than the Loom and Leaf Relaxed Firm mattress. I’m most concerned about temperature getting too hot. Thanks for pointing that out. It looks like that rating was in error and I’ve since corrected it. It does a great job of sleeping cool actually. Hey Joe – please clarify how hot you think this sleeps. In the write up you are very complimentary, but in the numerical ratings, not so much. Is it just cooler than other memory foam or actually cool? I think it might be the best within the memory foam category. You shouldn’t have a probably with sleeping hot on this mattress. Hey Joe.. I enjoyed your evaluations.. I am 6′ 1 and weigh 250..I like to sleep on both my back and my side.. is the as3 too soft for my weight? It’s a close call to be honest. I would reach out to the company themselves to see what they think. I enjoyed your review. I bought a loom and leaf relaxed firm about 45 days ago and it is too firm for me. I want a softer mattress but not at the 3 firmness scale. In your opinion, is the liberty softer than the loom and leaf relaxed firm? If so, considerably so or just a little? I found the Liberty to be slightly softer than the L&L relaxed firm.